Employees of Thiokol Chemical Corporation, known today as Orbital ATK, in Promontory, Utah, had the solemn responsibility over the years to produce solid rocket boosters for space launch vehicles as well as other products. Thiokol hired skilled artists to depict in art its challenges and accomplishments. In the 1980s and 1990s, high-end prints of their paintings were used to promote the company’s products at trade shows. An exhibit of Orbital ATK’s aviation art titled “Imagining Innovation: Aerospace Art” opens April 7 and continues through June 12 at the Brigham City Museum of Art. Work by Mark Waki and Allan Eaton, employees at the Promontory facility, will be on display. Waki was hired as a model builder and illustrator in 1982 and has become a space program artist of wide renown. He has completed 30 major paintings for the company. Waki’s artwork has been displayed with the U.S. Air Force Art Collection in New York, at the Pentagon in Virginia, The U.S. Air Force Museum Wright-Patterson AFB in Ohio and the Paris Air Show in France. Waki and his brother Matthew painted a large mural for the Thunderbirds Air Demonstration Squadron, and it’s on permanent display at Nellis Air Force Base in Nevada. 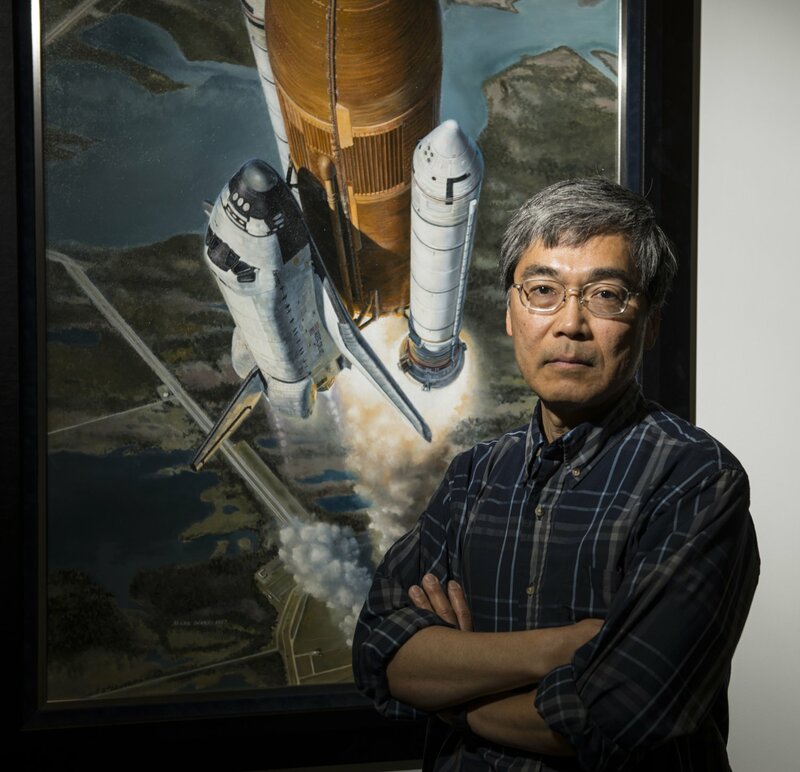 The painting “T+30” by Waki that depicts a space shuttle 30 seconds into flight is widely thought to be the most reproduced space painting ever. One of Waki’s works hanging in the exhibit is “Killer Scouts.” It depicts the U.S. Air Force F-16C Fighting Falcons making a morning attack on enemy targets during Operation Desert Storm. The artwork pays tribute to the 388th Tactical Fighter Wing from Hill Air Force Base for participating in the liberation of Kuwait in February 1991. Included in the exhibit is Eaton’s “Challenge Traditions,” a montage of significant transportation events throughout history. Utah’s connection is illustrated by a space shuttle rising above two trains facing each other when the ceremonial “golden spike” was driven at Promontory Summit connecting the first transcontinental railroad in 1869. The history of Thiokol is as fascinating as spaceflight. In 1926, two chemists, Joseph C. Patrick and Nathan Mnookin, were trying to invent an inexpensive antifreeze. While experimenting with ethylene dichloride and sodium polysulfide, they created a gum that emitted a terrible odor and clogged a sink in the laboratory. None of their solvents could remove the gum. The frustrated chemists then realized that the resistance of the material to any kind of solvent was a useful property. They had invented a synthetic rubber, which they christened “Thiokol,” a combination of the Greek words for sulfur and glue. Thiokol Corporation was formed in 1928 to commercialize the new product. The company’s future changed forever in 1945 when scientists discovered that the polymer made the best solid propellant fuel binder known to man. In 1947, Thiokol entered the solid rocket motor market. This exhibition was supported, in part, by Orbital ATK.